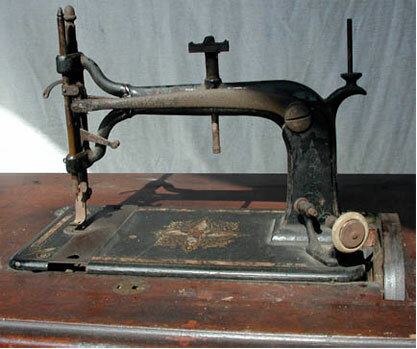 This Weed treadle sewing machine was made in Hartford, Connecticut. The last listed patent date is 1872. We rescued this old machine in the Salamanca Antique Mall in New York. We were thrilled that the drawers contained all the original accessories and the shuttle and throat slide plates were intact. Many times these parts become separated from the machines and it can be difficult to impossible to find replacements. The center "T" shaped piece is the tension control. After a bit of oil it was a remarkably free running machine. We have not tried to sew on it. 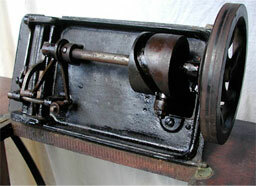 Note the location of the handwheel. 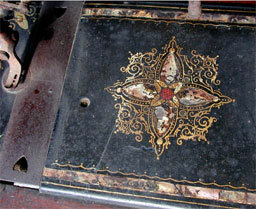 The base is decorated with a beautiful medallion with mother-of-pearl inlay as seen below.